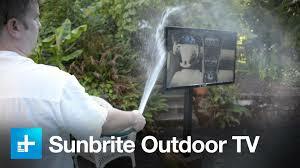 SunBriteTV hi-def TVs are the only time-tested televisions in the world that are specifically designed and built from the ground-up for the outdoor environment. We don't simply create a "shell" for an indoor TV. Instead, we engineer TVs optimized for outdoor viewing, and safe for use in outside conditions - rain, heat, cold, salt-air, humidity, dust. Enjoy outdoor entertaining with the industry-recognized leader in outdoor television.